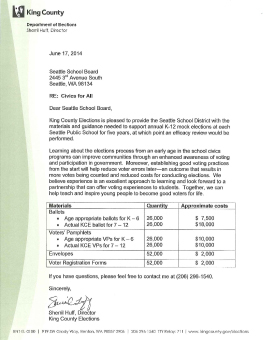 Voting and elections: All Seattle public schools will hold K-12 mock elections in a manner that befits each school. King County Elections (KCE) has officially committed to funding these elections at $50,00 per year over a 5 year grant period with efficacy review at that point. 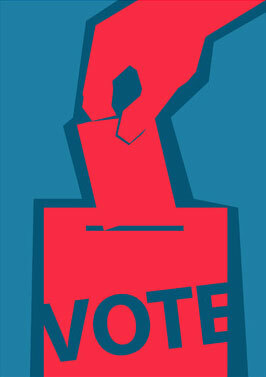 KCE will provide age-appropriate ballots and voter’s guides to ALL Seattle public schools! Schools can choose to do digital voting via the Sec. of State’s Office‘s superb student on-line voting site, or “old fashioned” ballot-style voting (a fun way to do it!). Because research proves that youth voting increases citizenship aptitudes for life we must teach kids how to vote from K-12 . Also, all K-12 schools will encourage students to register family members and others and high school social studies teachers district-wide will continue their fall of 2012 commitment to a shared effort to register all seniors in Seattle public schools. King County Elections (KCE) and the Sec. of State’s Office in Olympia have committed to assist in these endeavors. Social studies would make civics perspectives a constant, intentional point of reference in all K-12 social studies classes. The emphasis on alignment with Common Core Standards in History/Social Studies and English/Language Arts Reading and Writing will predominate. At present, the Seattle Public Schools requires only a minuscule total of three week-long civics units (called civics CBAs (classroom based assessments) for the entire K-12 span! The Civics for all initiative calls for three civics CBAs to be completed at each grade level – this dedicated time for teachers and students to spend on civics meets is an essential feature of the proposal and dovetails easily with both state and district content & skills requirements. For more info on CBAs click here and here. It is understood that the wide majority of social studies classes would do one of the CBAs each October/November as an “Election/Voting” CBA, leaving two Civics CBAs for the remaining 8 months of the school years. At the grade 6-12 level the “ Political Spectrum” banner would be posted on all SS classroom walls (41 SSD high school social studies teachers have already hung this banner in their room). The Essential Civics Questions banner will hang in all K-12 classrooms but it will get most use in the social studies, where the expectation will be that teachers will identify and infuse at least 2 essential questions into each unit plan, aside from and beyond the CBA’s. Also encouraged: a) more intentional coverage of current events, including elections; b) more regularity in use of service learning lessons – when outside-classroom community and political engagement activities are unfeasible, in class “policy-based service learning” activities are an excellent alternative. Four programs that district elementary classes use now on an ad hoc basis — iCivics, Project Citizen, Storypath and We the People —would be drawn from and used in an intentional manner as befits each school’s preferences. Media-literacy instruction: Media-literacy, especially related to electoral politics, will be a required objective, primarily in social-studies and language-arts classrooms. Current events coverage, from organizations like CNN Student News (5 min. daily segments available, no cost) and others would occur frequently to merge civic literacy with media-literacy via current events. Civic literacy is unattainable without media literacy. Media literacy amongst teens, especially regarding electoral politics, is virtually nil and is rarely taught in our high schools and it must be asap if we are to give our children the tools to discern the choices that they will be forced to make as they participate in our democracy. Media literacy lessons are extremely popular with students and their interest in television and skills with computers and social media offer an enormous opportunity to extract more productivity from them. Great lessons like these can help immediately. Seattle is a nationally recognized hotbed of civic media education initiatives – there are boundless opportunities for growth and partnerships in this area. Puget Sound Off, the award winning website, is a superb tool for teachers to use to cultivate civic engagement for youth in areas of personal interest.